Figure 1. 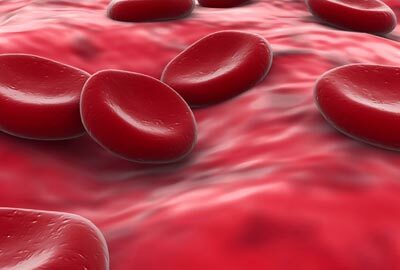 Red blood cells (erythrocytes), such as those in human blood, get their color from hemoglobin. But other types of blood use different pigments and come in a variety of surprising colors, including green and blue. Figure 2. Horseshoe crab blood contains hemocyanin (a molecule based on copper), which gives it a blue tinge. Credit: Fish & Wildlife Research Institute. Figure 3. 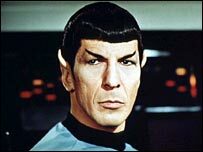 Is Mr. Spock's green blood due to a vanadium compound? In the original Star Trek episode "Obsession" Spock claims his blood contains copper but this suggests hemocyanin, which is blue. This entry is based on material from the section "Alien Blood" in the book Xenology: An Introduction to the Scientific Study of Extraterrestrial Life, Intelligence, and Civilization by Robert A. Freitas, Jr. The blood that circulates through human bodies is not the only kind on Earth. Other organisms use blood that differs both in color and chemical composition from our own. This has led scientists to speculate about what other forms of blood might exist among extraterrestrial species (see Figure 1). The single most remarkable feature of blood is its exceptionally high capacity for carrying oxygen. This is made possible by the presence of a metal-containing pigment, which is attached as a prosthetic group to the blood's protein. The pigment combines reversibly with oxygen, picking it up in a lung or a gill and ferrying it to the cells before letting it go. This process works because the pigment combines with oxygen at high partial pressures, found within the organism's respiratory organ, then releases it at the comparatively low pressure within cells. The most widely-distributed blood pigment on Earth is hemoglobin (Hb), a molecule of which consists of a porphyrin ring with a central iron atom hooked to a clump of protein called globin. Hemoglobin is found throughout the animal kingdom, in all vertebrates (except a few Antarctic fish1), and in the circulatory fluids of many invertebrates, including annelid worms, many arthropods, and some echinoderms, molluscs, and crustaceans. It is the most efficient oxygen-carrier known. For the better part of a century, chemists have sought in vain to manufacture substances that can do a better job. Several other pigments have been discovered in nature, which, while not as efficient as hemoglobin, are able to serve as adequate oxygen-transporters in certain environments. The copper-containing pigment hemocyanin, second in breadth of distribution after hemoglobin, occurs in the blood of various molluscs and arthropods (see Figure 2).2, 3 Unlike human blood, which is bright red when oxygenated in the arteries and dark red when deoxygenated in the veins, hemocyanin blood is a beautiful blue in the arteries and as clear and colorless as water in the veins. Hemocyanin is always found roaming free in blood plasma, instead of confined within corpuscles as are the relatively smaller molecules of Hb. This copper-based, proteinous, non-porphyrin blood pigment is only about one-quarter as efficient as hemoglobin at carrying oxygen.4 Could advanced forms of blue-blooded life – the equivalent of mammals, say – exist on other worlds? Conceivably they might on planets with high surface pressures and abundant oxygen, where great oxygen-carrying efficiency wouldn't be at such a premium. Another free-floating respiratory pigment found in a variety of tubular annelids (Polychaeta), again with about 25% the efficiency of Hb, is chlorocruorin.3 Solutions of this iron-based pigment are green when dilute, but vivid red at higher concentrations. The blood of one species, Serpula vermicularis, is remarkable in that it uses a dual hemoglobin/chlorocruorin system. Hemerythrin is an iron-containing proteinous pigment found in the blood of certain bottom-dwelling marine worms, including some nematodes and annelids, and brachiopods. A reversible oxygen carrier, it too is far less efficient than hemoglobin. Blood containing this pigment is bright pink or violet when oxygenated, but colorless by the time it reaches the veins. Like Hb, it is a small molecule that must be confined to corpuscles in the bloodstream rather than allowed to float freely. Another naturally-occurring blood pigment, vanadium chromagen, is found in sea squirts, ascidians, and tunicates.5 Contained within tiny corpuscles known as vanadocytes, it usually makes blood apple-green, though this may change to blue or orange in the presence of different vanadium oxides.6 The respiratory functions of a copper-based porphyrin, found in the wing feathers of Turacus indicus, and of a brown manganese-based porphyrin, known as pinnaglobin, that occurs in the blood of the mollusc Pinna squamosa, are less well understood. Life forms on other worlds might use various combinations of any of the above pigments to convey oxygen to their cells, resulting in blood of virtually any color. Yet the inventory of natural oxygen-carriers on Earth far from exhausts what might be possible elsewhere in the cosmos. Despite the fact that reversible oxygen binding is a fairly rare property, chemists have been able to synthesize Hb-like chemicals that are capable of reversible combination with oxygen.4 For example, a simple iron-indigo compound functions quite well in this regard, as do porphyrin complexes of manganese and cobalt unknown in terrestrial respiratory systems.7, 8, 9, 10 A wide range of cobalt histidines and "coboglobins" have been investigated that might find use in alien biochemistries.8, 11, 12, 13, 14 In fact, there is some precedent for this on Earth: vitamin B12 is a cobalt-based porphyrin. Coboglobin blood would be colorless or slightly pink when oxygen-enriched, but dark yellow or deep amber in the veins. (Like hemocyanin, hemerythrin and coboglobin are not destroyed by carbon monoxide as is hemoglobin. Organisms with these kinds of blood pigments thus would not be poisoned by the gas, as humans are.) A molecule of coboglobin loses its ability to reversibly bind oxygen in less than a day, compared with weeks in the case of human hemoglobin. But this shouldn't rule out its use in alien blood. Millions of human blood cells are broken down and rebuilt each minute of our lives, and it isn't implausible that alien organisms may have evolved a more efficient biochemical apparatus for the recycling and reconstitution of blood pigment than have Earthly animals. Nor is the relative scarcity of cobalt compared to iron a significant factor. While cobalt is only about one percent as abundant as iron in terrestrial seas, it is roughly as abundant as phosphorus, chlorine, and potassium, all of which are common in mammalian biochemistry. Moreover, the elements copper and vanadium, found in the blood pigments hemocyanin and vanadium chromagen, are almost an order of magnitude scarcer than cobalt in the cosmos and are of comparable abundance on planetary surfaces. Another interesting, though less likely, extraterrestrial possibility is iridium-based blood. The compound chloro-carbonyl-bis(tri phenylphosphine)-iridium has been shown to undergo reversible oxygenation.15, 16 Although it is insoluble in water and other polar media, such as liquid ammonia and alcohols, this poses no barrier to its use in blood: the vanadium chromagen found in ascidians is also water-insoluble. In solution, the iridium compound takes up one atom of oxygen per molecule to change from brilliant yellow to dull orange. 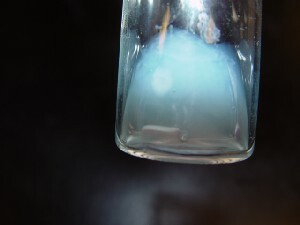 The reaction is not quite as fast as with the cobalt complexes, so a more convoluted lung would be necessary. When oxygenated, iridium-based blood would need to be shielded from light because of its high photosensitivity. The pigment slowly decomposes over a period of days or weeks when exposed to strong light, gradually changing color from orange to green and finally to a deep bluish-black. Iridium-blooded aliens would thus have to be dark skinned or inhabit a dimly lit world. (In the absence of light, the molecule is stable for years.) The iridium complex has another property of interest to astrobiologists: it can reversibly bind to hydrogen as well as oxygen. Probably many other reversibly binding compounds exist that chemists have yet to study, and little consideration has been given to the possibility of extraterrestrial life using oxidants other than oxygen. To date, chemists have scarcely considered reversible chlorine- or sulfur-binding. The term "blue blood" is applied to a hypothetical kind of blood possessed by certain elite and aristocratic groups. The expression came from some Spanish families of Castile, who were intermarrying. They were fair skinned, so that their veins were more noticeably blue than those of the prevailing dark-complexioned population. Of course, veins are white and venous blood is dark red. The blue appearance is caused by the refractive qualities of the tissues through which veins are seen. "blue blood" is a direct translation of the Spanish sangre azul. 1. Everett L. Douglas, David J. Chapman, and Edvard A. Hemmingsen, "Absence of Porphyrin Respiratory Pigments in the Blood in the Antarctic Icefish Chaenocephalus aceratus"; Cryobiology 10 (1973):260-261. 2. James R. Redmond, "The Respiratory Function of Hemocyanin in Crustacea", Journal of Cellular and Comparative Physiology 46 (October 1955):209-242. Reprinted in Bradley T. Sheer, ed. ; Comparative Physiology: A Book of Readings; (Wm. C. Brown Company Publishers, Dubuque, Iowa; 1968), pp. 162-194. 3. P. J. Mill, Respiration in the Invertebrates; (Macmillan, St, Martins' Press, N. Y.; 1972). 4. H. P. Wolvekamp, "The Evolution of Oxygen Transport". In Robert Gwyn Macfarlane, A. H. T. Robb- Smith, eds. ; Functions of the Blood; (Academic Press, N. Y.; 1961); Chapter I, pp. 1-72. 5. D. B. Carlisle, "Vanadium and Other Metals in Ascidians"; Proc. Roy. Soc. B. 171 (August 1968):31-42. 6. Ernest Baldwin, An Introduction to Comparative Biochemistry; (Cambridge University Press, Cambridge; 1964). 4th Edition. 7. Kunz, Kress, Ber. 60 (1927): 367. 8. John Z. Hearon, Dean Burk, and Arthur L. Schade, "Physicochemical Studies of Reversible and Irreversible Complexes of Cobalt, Histidine, and Molecular Oxygen"; Journal of the National Institute 9 (February 1949):337-377. 9. Aviva Lapidot and Charles S. Irving, "The Electronic Structure of Coordinated Oxygen"; in Osamu Hayaishi, ed. ; Molecular Oxygen in Biology: Topics in Molecular Oxygen Research; (American Elsevier Publ. Co., Inc., N. Y.; 1974). 10. J. E. Falk, Porphyrins and Metalloporphyrins; (Elsevier Publishing Co., N. Y.; 1964). 11. B. M. Hoffman and D. H. Petering, "Coboglobins: Oxygen-Carrying Cobalt-Reconstituted Hemoglobin and Myoglobin"; Proc. National Acad. Sciences 67 (Oct. 1970):637-643. 12. Arthur E. Martell and Melvin Calvin, Chemistry of the Metal Chelate Compounds; (Prentice-Hall, Inc., N. Y.; 1952). 13. L. Michaelis, "Molecular Oxygen as a Ligand in Metal Porphyrins and Other Metal - Complex Compounds"; Federation Proceedings 7 (Sept. 1948):509-514. 14, L. Michaelis, in G. B. Sumner and K. Myrbäch, eds., The Enzymes: Chemistry and Mechanism of Action, Vol. II; (Academic Press, N. Y.; 1951) pp. 1-54. 15. L. Vaska, "Oxygen-Carrying Properties of a Simple Synthetic System"; Science 140 (May 17, 1963):809-810. 16. L. Vaska, Loomis S. Chen, C. V. Senoff, "Oxygen-Carrying Iridium Complex: Kinetics, Mechanism, and Thermodynamics"; Science 174 (November 5, 1971):587-589.